Hundreds of thousands of people in at least 150 countries around the world demanded action on climate change as the UN conference began in Paris this week. Catholic organisations advocating to protect the world and its people from the impact of climate change said the terror attacks in Paris had not dissuaded them from attending a major UN summit there. A group of interfaith pilgrims who had cycled from the UK to hand in a petition arrived in Paris yesterday and this morning the walkers and cyclists gathered in the Salle de la Légion d'honneur de Saint-Denis, opposite the Basilica of Saint-Denis, to see the various petitions with 1.78m signatures handed to political leaders meeting at COP21 from Monday. 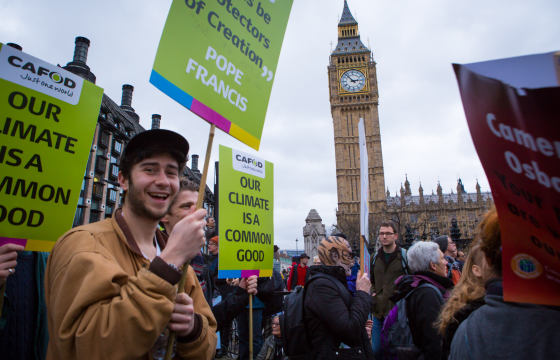 The total number of Catholic signatories from the UK was more than 850,000. At the handing over, Brazilian Cardinal Claudio Hummes, president of the Pan-Amazonian Church Network, referred to Pope Francis' encyclical "Laudato Si', on Care for Our Common Home," and to an October appeal by Catholic bishops worldwide that called "for a fair, binding and truly transformational climate agreement in Paris." "And we ask wealthier countries to aid the world's poorest to cope with climate change impacts, by providing robust climate finance," he added. Meanwhile, the authorities in Paris had banned any demonstrations in the aftermath of the terror attacks a fortnight ago. Hundreds of thousands of people who had planned to march at the start of the talks to show their support for climate change donated their shoes to stand in their place at the Place de la Republique. 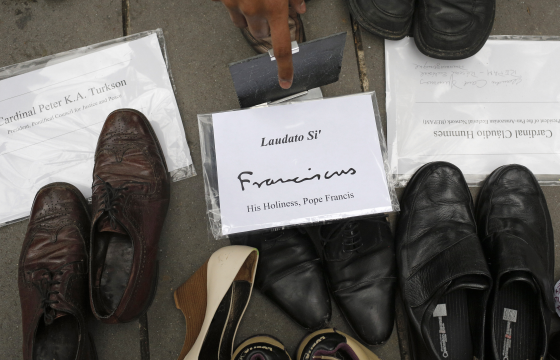 Pope Francis, who was flying back to the Vatican after a successful trip to Africa, donated a pair of black Oxford shoes to take part in the demonstration, Jesuit Father Michael Czerny, who works at the Pontifical Council for Justice and Peace, confirmed. Cardinal Hummes and Cardinal Peter Turkson, president of the Pontifical Council for Justice and Peace, also signed and donated shoes. 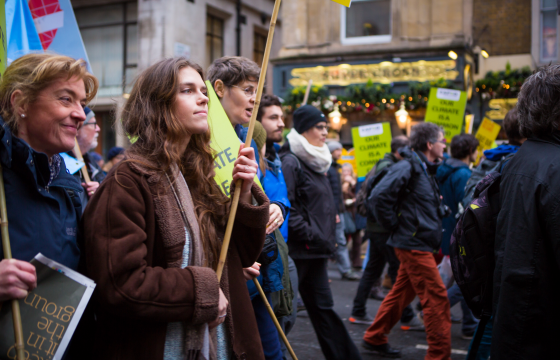 From Seoul, South Korea, to Ottawa, Ontario; New York to Sao Paulo, people marched to demand climate change. In Manila, Philippines, dozens of religious added their voices to the cry of mostly Catholic activists during a climate march on a humid, overcast morning. In the plaza across the street from Our Lady of Remedies Church, Sacred Heart Missionaries seminarian Reynon Ajero held up colorful signs that said "Resist the plunder of our environment" and a reference to the pope's "Laudato Si'." Ajero said he grew up in a mountainous village in the southern province of Zamboanga del Norte populated with "plenty of diversity" in animals, trees and wild flowers. On 29 November, he lamented the significant loss of trees to mining and the disappearance of the animals from his childhood. "I want to ask all the people to be awake," he told Catholic News Service. "I want make the people know that we are suffering for what is our mistake to our mother earth. So whatever we do to ourselves, we do to the mother earth, it will return to us." This message in the plaza was played out over and over in singing, dance numbers and dramatizations of the impacts of the earth's rising temperatures. Manila Auxiliary Bishop Broderick Pabillo opened an outdoor Mass with a prayer of hope during the lighting of the first candle on an Advent wreath. "Hope for the enlightenment of all peoples, that we are just a strand in the web of life, that what we do to the environment, we do to ourselves," said Bishop Pabillo. Lou Arsenio, head of the Manila Archdiocese Ecology Ministry and one of the originators of the Global Catholic Climate Movement, since the movement started about a year ago, she has seen greater awareness among Catholics, but she told Catholic News Service there is more work to do. In Melbourne, Australia, more than 40,000 people marched in the city's central business district to call for action on climate change. A statement on the website of the Archdiocese of Melbourne said Catholics were at the forefront of the march. Honduran Cardinal Oscar Rodriguez Maradiaga, former president of Caritas Internationalis, told the crowd: "We were given a garden. We may not deliver back a desert."